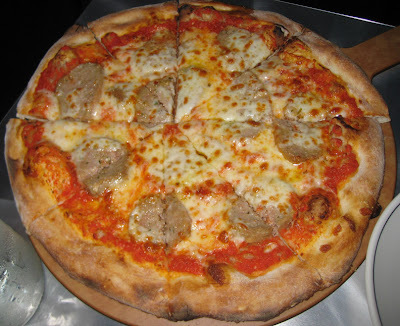 There's been a lot of buzz about the new Italian restaurant in town, Chazz: A Bronx Original, and Mr Minx and I were excited to receive an invitation to sample the menu. 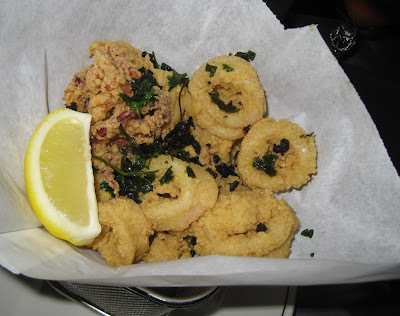 A partnership between actor Chazz Palminteri (The Usual Suspects) and local restaurateurs Sergio and Alessandro Vitale (Aldo's), Chazz specializes in coal-fired pizza but is much more than a pizza joint. Mr Minx and I started out our meal with a couple of drinks from their list of signature cocktails. 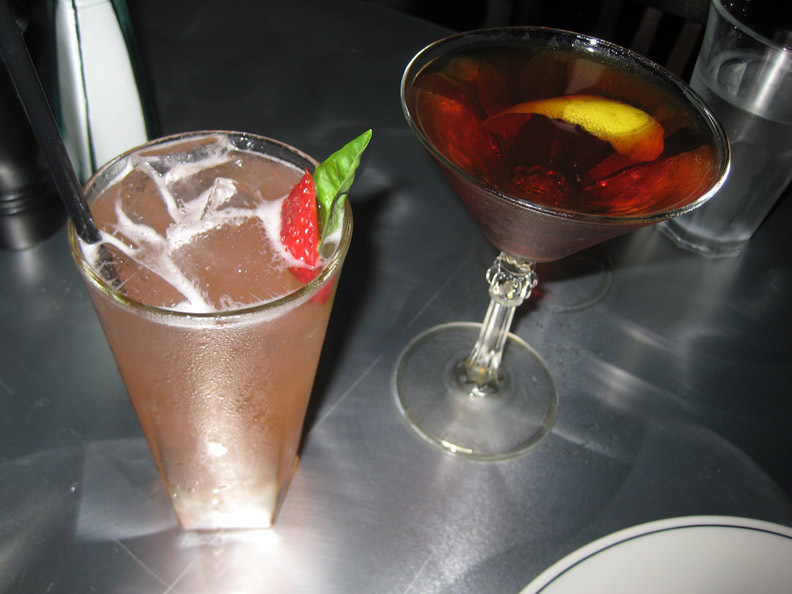 Mine was the tartly refreshing and possibly too easy to drink Al Fresco, made with strawberries, lime, basil and the locally-produced Sloop Betty vodka. Mr Minx, a sucker for a Manhattan, tried the Pikesville, a classic made with Maryland-produced rye whiskey. It seemed somehow lighter than the usual version, which made for a pleasant Summer sipper. Because there are so many categories on the menu, it was hard to decide what exactly we wanted to sample. We were advised to try a cheese, a pizza, a pasta, and an appetizer, but the vegetable selections tempted us. As did the bruschette. And panini. And salads. We couldn't possibly have eaten one of each (ok, maybe we could have), so we went for things that sounded the most tempting. 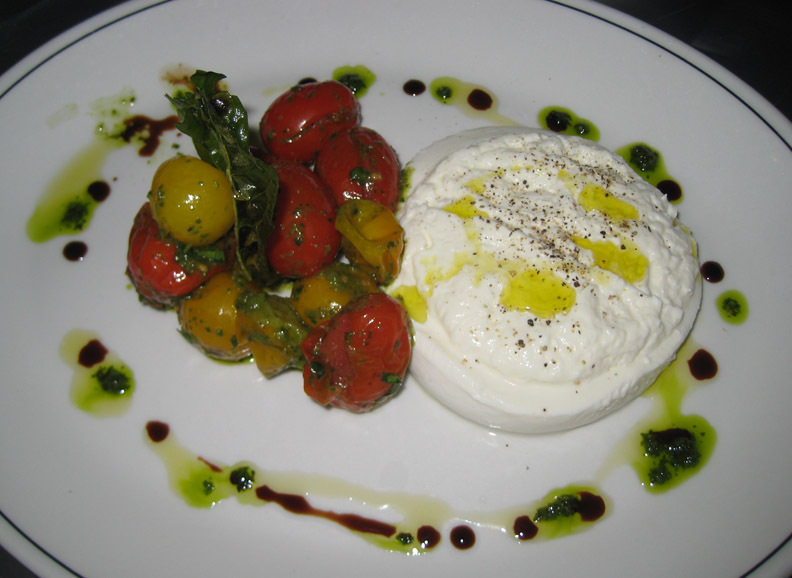 We started out with Chazz's rendition of a Caprese salad, this one featuring a honkin' slab of Burrata cheese, with roasted tomatoes, pesto, and a balsamic syrup. Burrata is a fresh cheese comprising a shell of mozzarella filled with more mozzarella and cream, and Chazz imports theirs from Italy the day it's made. In other words, it's very fresh, and almost evilly luscious. The accompanying sweet little pesto-coated tomatoes added a bit of refreshing acid to the dish; all I needed was a loaf of crusty bread and I would have been quite satisfied to call it dinner all on its own. Because I am a real sucker for fried calamari, we tried Chazz' version. These were piping hot, perfectly crisp, tender, and well-seasoned. A fine example of the dish that has become an appetizer staple. spicy tomato sauce (not pictured). 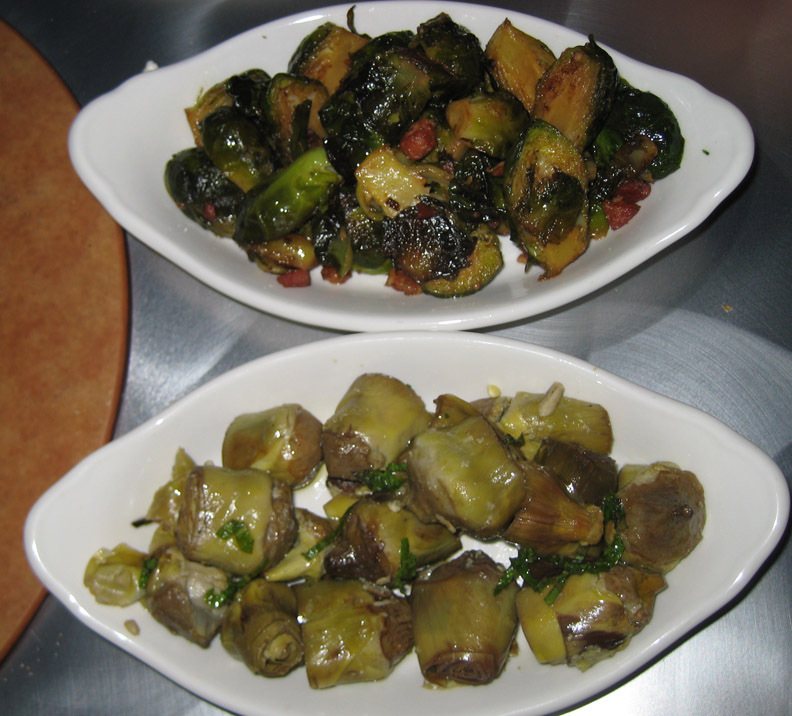 To be different (and pretend-healthy), we sampled two of the vegetable dishes: roasted Brussels sprouts with pancetta, and Roman-style artichokes. We loved the sprouts (because we love them in any form) with their chewy nuggets of bacon, but they are pretty well-cooked and might be too-cabbagy for some. The artichokes, served at room temperature, have an almost creamy texture and are accented with a bit of mint. The veal meatball appetizer is a signature dish, but we chose to try the tender and juicy meatball sliced onto a NY-style pizza instead. Mr Minx is always on the search for a thin crust pizza that isn't too doughy and that has a nice cheese-to-sauce ratio, and I think he's found it. Leftovers were just as delicious two days later. Besides the Burrata, my favorite dish was the spaghettoni, a thick spaghetti topped with a spicy tomato sauce containing guanciale (a bacon made from the jowl or cheek). 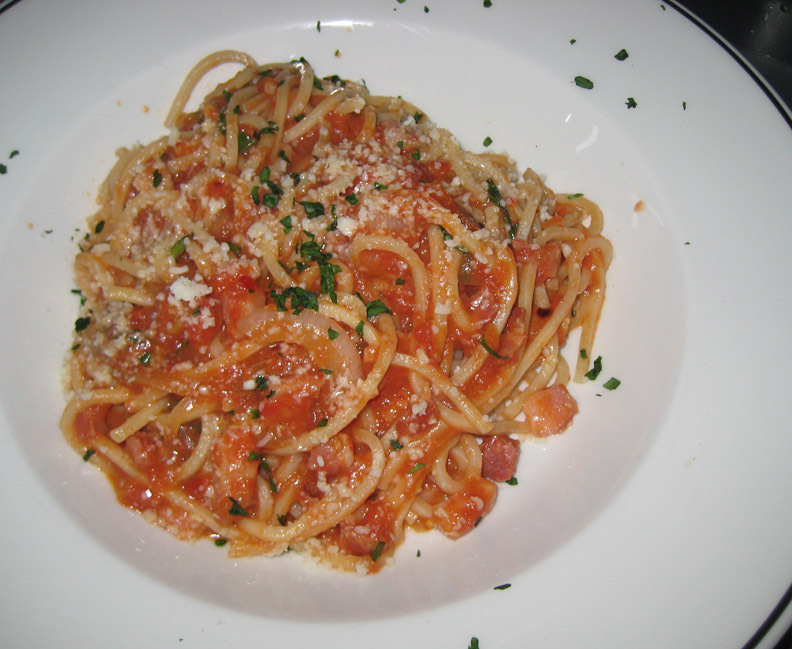 The fresh pasta was perfectly al dente, and the sauce had a serious kick to it. We ordered a half portion which was almost hard for me to share, except for the fact that we had so much other food! Many of the Italian restaurants in and around Little Italy get their desserts from Vaccaro's, so we usually skip the middle-man and head directly to the Little Italy institution to gorge on cannoli and gelato. However, Chazz has an in-house pastry chef, Janae Aiken, who trained at the CIA; that made it imperative that we try desserts. Sorry, Vaccaro's, but I gotta say Chazz's cannoli is some stiff competition, with a ricotta filling made extra-rich by the addition of heavy cream. 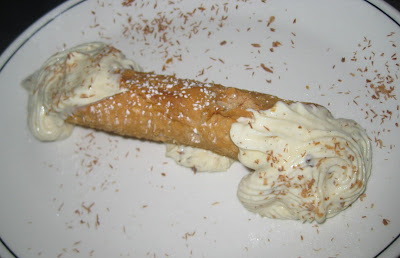 My only criticism (of the entire meal, actually) is that there might have been a bit too much cinnamon in the filling. We also sampled the ricotta cheesecake and the chocolate espresso torte. 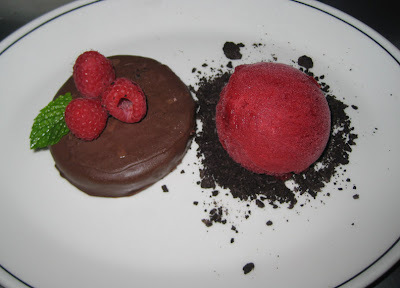 What sold me on the torte was the accompanying scoop of raspberry lime granita - a bit of tanginess to offset the sweet chocolaty richness of the torte. 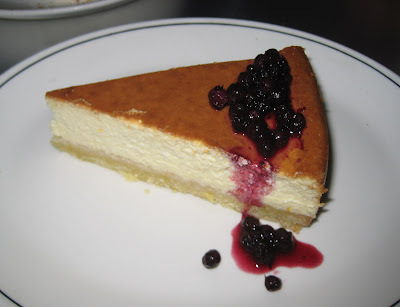 The cheesecake was that perfect texture in between fluffy and dense, and I loved the tiny wild blueberries on top. After gorging ourselves, we (and our doggie bag) went home quite full. And satisfied. I have to admit that we were impressed by the offerings at Chazz, a red-sauce joint that manages to be much more than that. By the time we left the restaurant, it was full of happy, noisy diners, some enjoying multi-course meals, and others who had just popped in for a pizza. While the overall feeling of the restaurant is fairly casual, the quality of the food would make Chazz a good special-occasion spot, too. I know we'll be back.